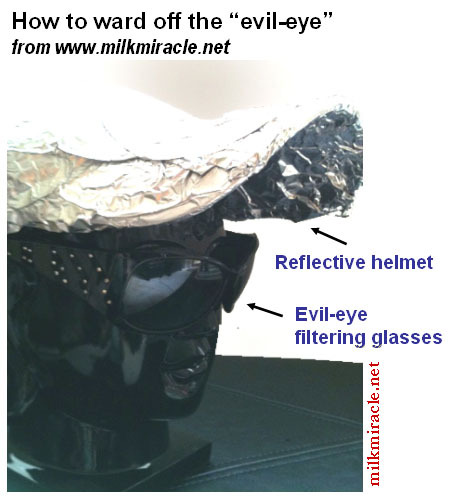 Facile technology for warding off the evil-eye: inexpensive “nazar suraksha” | It's a Miracle! This entry was posted in Bollywood science, desi, filmi, fraud, How-to, human nature, pseudomedical, Quackery, scams, scientifiky and almost science by Anirban. Bookmark the permalink. These rays from eyesremind me so much of the war sequences i saw in Ramayana…Thoe arrows with all tgheir viguor used to flow nd so deos these eye rays!! Lovedddddddddd that helmet thing Ani…U ra genius..It cracked me laughing.. Thank you Nish. I am trying to figure out what program the arrows are made with. Probably Pinnacle or some low-end video editing software. Keep posting.. waiting to see the next installment. I think the next should be on those slimming medicines.. or alternatively, how to make people THINK you are slim. Yogesh, I am going to link your post in mine. I knew you were going to write on an arbitrage opportunity, so I took a different angle. You’re spot on. A family friend who recently returned from Cyprus also mentioned that they were much cheaper in there. Thanks also for the suggestion. This one to a lot of time to get together, so I’m going to wait until lightning strikes for the next post. If Corey Hart can wear his sunglasses at night then I think it is safe to say we can wear them indoors too! Awesome…. your posts are of a different league altogether.Intelligent and funny. I have to admit that there are some key members in my family who believe in the nazar factor. They do not share good news and never wear anything fancy. It is sad but an every day way of life among ‘nazar’ fearing folks.Loved it !! Enjoy the long weekend !! Liked it a lot, really. Thanks, for reading Gurdit. The idea was inspired by comments in the previous post and it came to me immediately. From concept to creation took much longer. which will allow them to make further advances in warding it off. Simply stated I want a fashion forward AND a reliable means to a cure. Keep me posted. Thank you for helping to both raise awareness AND to find a cure. Godspeed to you! That is an excellent photo. I am guessing that the powerful rays are coming from the eyes of an “icchadhari nag” (shapeshifting snake). Is it from Nagina? I am looking for a fashionable label to market different designs for the glasses and the helmets. You’re very close, the image is not from “Nagina,” but from “Nigahen: Nagina Part II” (1989). Ah, if you get the fashionable label to cooperate, the sky is the limit! i was just thinking of putting this Nazar Suraksha Kawach to the ultimate test.How about getting these installed all across our borders.Can then rest and relax in peace.China should stop taking us over and Pakistan can ruin itself like Afghanistan over wars among their own tribes after everything. I want to place an order, but I would like to get a few things clarified first. Can I nullify the effect of nazar by my own nazar? Can I escape someone’s nazar by just protecting my head and eyes? I can’t wear protection for eyes and head all the time – can I have some Complan/Boost type suraksha that would make me nazar-safe from inside? Unless you suffer from total internal reflection of nazar at unfortunate angles, these items will work. Head and eye protection works against nazar well. We are currently developing anti-nazar nanoparticles that will work internally as well.